I bought this dress yesterday for $3.50 when Savers was having their annual 50% off sale. I'm pretty sure Mrs. Lasseter, my first grade teacher, had this exact dress. It looked okay on her in the glory days of the 80's, but it wasn't looking so hot on me this afternoon. Then I got out my miracle worker: my studded, elastic belt (also seen here and here). I bloused the dress up to be a tad shorter, and voila! The dress was instantly revamped and now I'm feeling so not like a first grade teacher at all. Sorry, Mrs. Lasseter. I have had these shoes for 10 years. 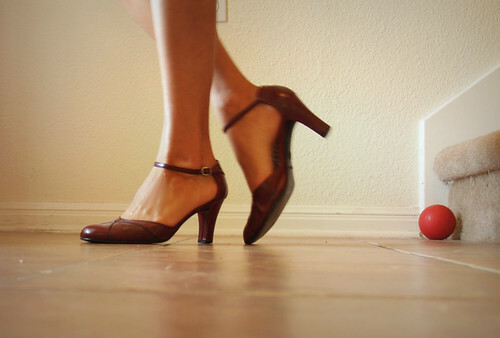 I bought them at Payless and used to go swing dancing in them. Aside from my Doc Martens, these are the oldest shoes in my collection. I love my new ring, but the shop girl at Modern Millie refused to divulge where she got them. Since Modern Millie is clear across the country and they don't offer online shopping, if anyone knows where I can get more of these rings, please let me know! *Want to know a secret? I had a phone interview today for a writers program at a major cable network. My fingers are crossed. And yes, that does make it rather difficult to type. If I am chosen for the program, I'm sure Mrs. Lasseter would be so very proud... even if I've hiked her dress way up on me.